From the amazing creatrix Lisa Hunt, (Fantastical Creatures; Animals Divine; Shapeshifter, and Celtic Dragon Tarot), comes her latest tarot creation… Ghosts and Spirits Tarot, a breathtakingly beautiful deck that utilizes tales and legends of ghosts and spirits from around the globe. This stunning 79 card deck kept me on the very edge of my seat as I sat and watched it emerge card by card, on the Ghosts and Spirits FaceBook page and with each drawing Lisa posted I was absolutely blown away and I easily consider one of her finest works. 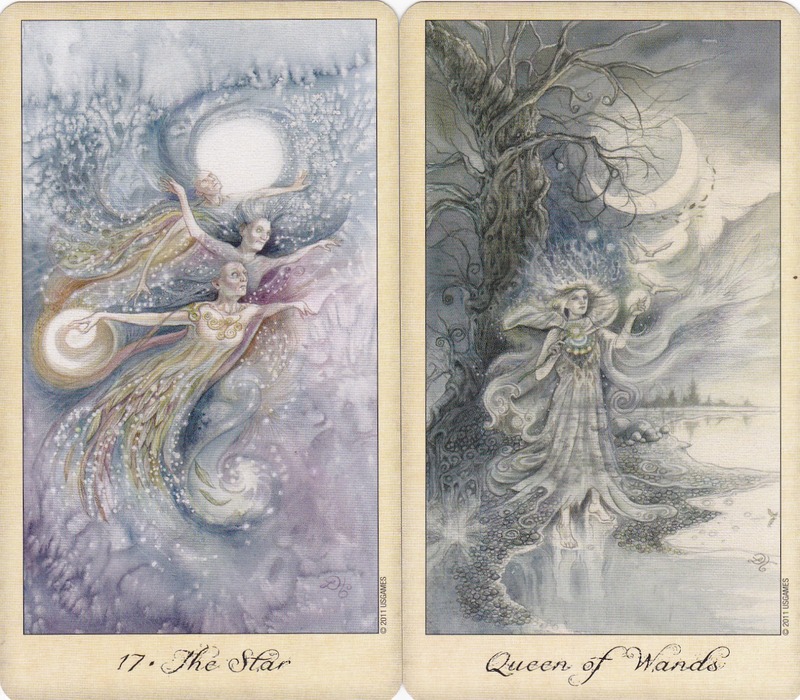 Lisa, who makes her home in Boca Raton, Florida, is the creator/illustrator of numerous tarot decks, all of which are still in print and even been translated in many different languages. She has been a freelance artist for nearly twenty years and her intuitive connection with the spirit world shines quite brightly in her Ghosts and Spirits Tarot. I was thoroughly thrilled when after receiving my deck, I found that there is a bonus card! I absolutely adore decks with extra cards such as the “Happy Squirrel” card found in Kat Black’s Touchstone Tarot and was even more blown away at the sheer depth of imagery found on this extra card which serves as a card for deeper reflections upon the question asked. The cards are beautifully bordered in a lovely parchment color with the title written in a gorgeous flowing script at the bottom of each card. The card stock is absolutely awesome, as usual with US Games decks, and it’s just the right size to be shuffled, even if you might have smaller hands. It has a wonderful glossy lamination and the design on the backs, which is pretty darned awesome in itself, features three swirling ghosts encircled by a ring of bones. The colors on the card backs are fantastically done and remind me of the beautiful patterns found on fine Batik fabric. 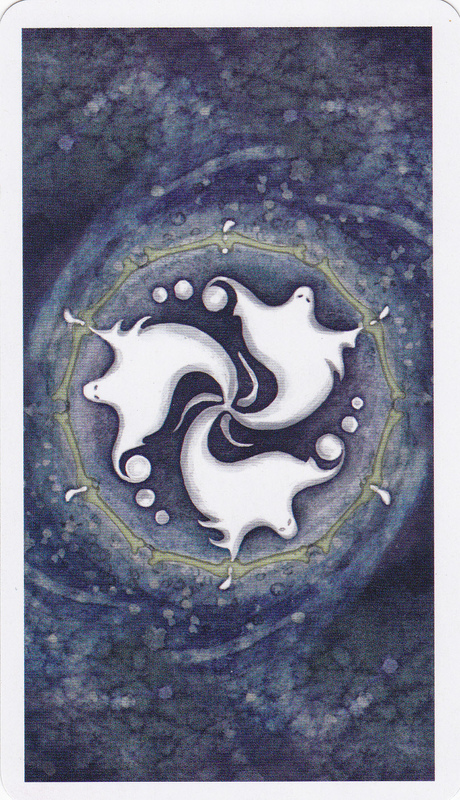 The LWB (little white book) accompanying the Ghosts and Spirits Tarot gives the story behind each ghost and where it originates as well as the definition of the card, although Lisa doesn’t give reversed meanings in the LWB, these cards can be read both upright and reversed. 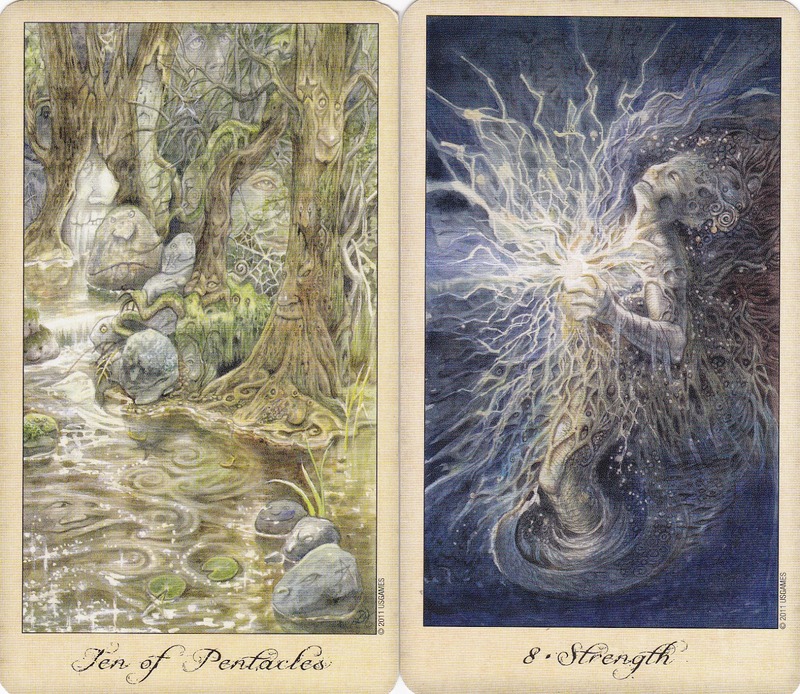 The imagery on the cards themselves are intricate and quite detailed and upon closer inspection, you can see faces and spirits reflected in the surrounding colors and patterns, such as the Fool, which details the Leshy (wood spirits that inhabit the dark forests of the Baltic’s) and all around this adventurer can be seen small sprites, stone creatures and faces peeking from the rocks and shrubbery. Such an awesome deck! 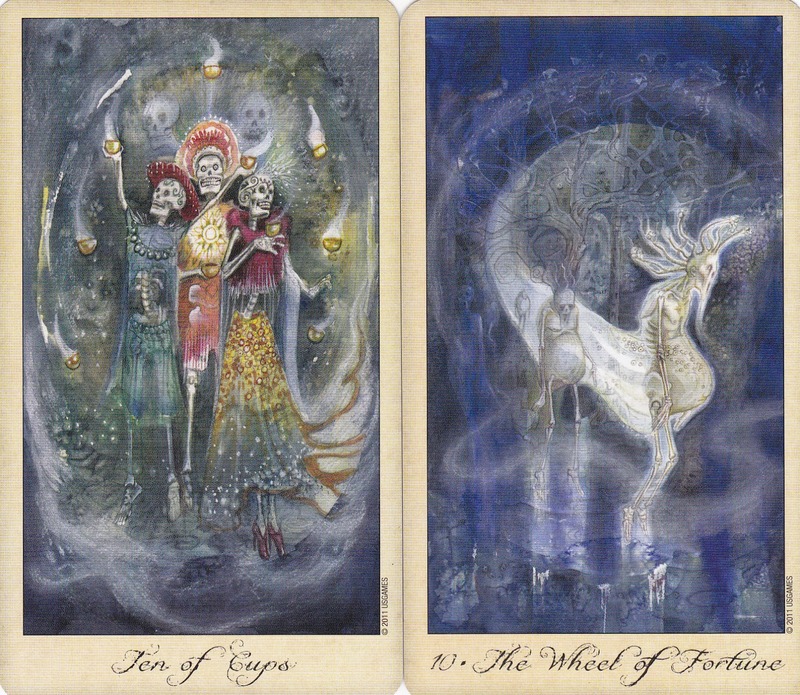 I usually look for my favorite cards when perusing a prospective deck but with The Ghosts and Spirits Tarot, there are just SO many wonderful cards I might as well admit that there is absolutely not one card that I do not connect with! The Ten of Cups pictures three figures from the festive Day of the Dead celebration that honors dead ancestors with feasts dancing and merriment. They are clothed in customary attire with blues, reds and yellows, surrounded by cups and faces reflected in Lisa’s surrounding artwork. The Moon features the legend of Aeneus’ Journey to the Underworld and the imagery shows two figures, one of which Aeneus, who has come to search for his father in the mysterious and frightening underground passage that is symbolic of the unconscious and home to our greatest dreams and biggest fears. This card shows both the rich imagery of the rewarded as well as the torment and suffering of the punished, it too is among my favorite cards in the Ghost and Spirits Tarot. This deck is simply too amazing and powerful that just descriptions alone do not come close to the wonder of holding this treasure in your hands and letting the Ghosts and Spirits speak to you in there own unique voice. I absolutely recommend this deck for both beginners and seasoned readers alike, it is truly a deck that one must have in their collection!